Ontario Soccer has announced the 10 organizations selected to help pilot the Same Game project. In partnership with the Canadian Association for the Advancement of Women and Sport and Physical Activity (CAAWS), Ontario Soccer has selected Brams United Soccer Club, Oshawa Kicks Soccer Club, Newmarket United Soccer Club, Ottawa St. Anthony Soccer Club, Cambridge Youth Soccer, LM Premier Academy, Guelph Soccer, St. Thomas Soccer Club, Ottawa Gloucester Hornets Soccer Club and Brampton Soccer Club to help test the Same Game model, which will assist organizations with creating more opportunities for the female leaders of tomorrow. 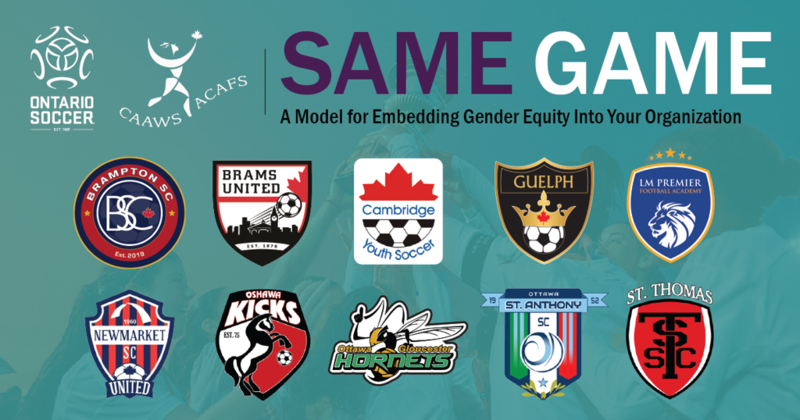 The Same Game model provides six steps to help community Clubs embed gender equality into their organizations and make tangible improvements in the retention and promotion of girls and women within and through sport, in Ontario and beyond. This project aligns with the Ontario government’s newly developed action plan —Advancing Opportunities for Women and Girls in Sport — and is timely for developing competency within the Ontario Soccer community and beyond to deliver real value for women and for sport. Visit OntarioSoccer.net for more on upcoming Female Leadership opportunities or visit CAAWS.ca for more on the Same Game model.